There are many ways you can support Food Allergy Canada, no matter what age you are! Here’s a story about one Canadian family that took the initiative to make a difference in their community. To mark Food Allergy Awareness Month last month, Delaney, and her 9-year-old sister Danica, who has no food allergies, brainstormed ways to raise money for Food Allergy Canada, as they wanted to raise awareness of food allergies, and support research. According to Cindy, with a bit of help from her and husband Paul, the sisters made the bracelets “morning, noon, and night,” and sold them at school during recess. We asked Cindy, Danica, and Delaney a few questions about their fundraiser. How did the fundraiser go? What was the response like from other students and school staff? Danica: The fundraiser went great. Lots of kids came to buy our bracelets. They thought it was a good cause, and hopefully they are more aware about food allergies. We had some posters with allergy information and on how to stay safe at school. Delaney: I’m happy kids came to buy our bracelets – many of my friends bought them, and my teachers too. It makes me feel good that people know about food allergies. Cindy: Friends, family, and coworkers heard about our cause, and were also happy to support it. Overall there was a tremendous amount of positive feedback. I should mention too that their principal was very supportive of the endeavor. 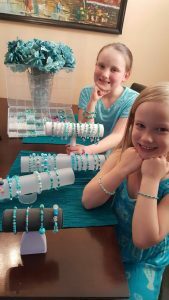 How many bracelets did the girls sell, and how much did they raise for Food Allergy Canada? Cindy: At school (Altona Forest PS in Pickering, Ontario), they raised $143, and sold 45 bracelets. Friends and family have been phenomenal, and we sold about 50 with donations totalling about $300 so far (final sales are being fulfilled now). We had to replenish our teal beads four times! In total, we hope to raise $500 for Food Allergy Canada. Cindy: As their mom, I am very proud of their dedication and hard work – our dining table has been our bead-making centre for weeks. We hope their fundraiser will make a difference and that the money raised will help Food Allergy Canada to continue to educate, advocate and support kids and families with allergies! Thank you so much for your generosity and dedication! Find out how you can start your own fundraiser in support of Food Allergy Canada.